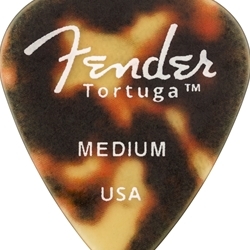 True to the Fender tradition of thoughtful experimentation, the Tortuga pick is designed with player’s performance in mind. Crafted from Ultem and an exclusive blend of nuanced tone-warming magic, these picks produce a slightly warmer tone than their pure Ultem counterparts. In addition to being more responsive, each pick bears a unique tortoiseshell pattern -- thanks to the extrusion process. This Fender exclusive pick material is available in various shapes and thicknesses to cater to players of all styles who are looking for that distinctive playing edge.